Aukey showed us multiple times already that they are capable of bringing to market peripherals with feature sets at a lower price than most others, including software-controlled full 1.8 M RGB backlighting on a mechanical keyboard at $65. 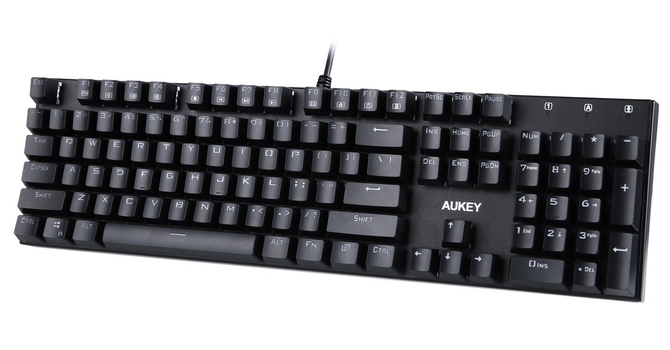 With many keyboards today going past the $100 price point and higher, I wanted to cover one that is more affordable and thus, my eyes naturally went to Aukey first. Turns out they had just what I was looking for, and thanks again to Aukey for providing the review sample. At first glance, nothing about the KM-G8 seems like it has been compromised for the sake of hitting a low price point. 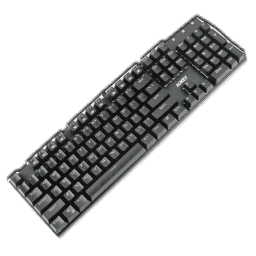 Indeed, we see it sport a full size, 104-key ANSI layout, an all-black color scheme with white legends and logo, and minimal bezels all around. We saw this design choice adopted by a lot of companies this year in an attempt to bring minimalism back to your desk while cutting down on material costs. Perhaps, it is just by having cut down the middle-men or having closer ties to manufacturing that Aukey is able to bring these products to market at lower prices, or perhaps it is in the subtle things we need to examine in more detail. Let us thus begin the review with a look at the specifications below. 1.02 kg / 2.25 lbs.